Since hitting bookstores in 2002, the hit comic series Than Dong Dat Viet (Viet Prodigies) has been considered a breath of fresh air into the country’s comic industry, encouraging young aspiring artists to pick up their pens and give the comic industry a try. 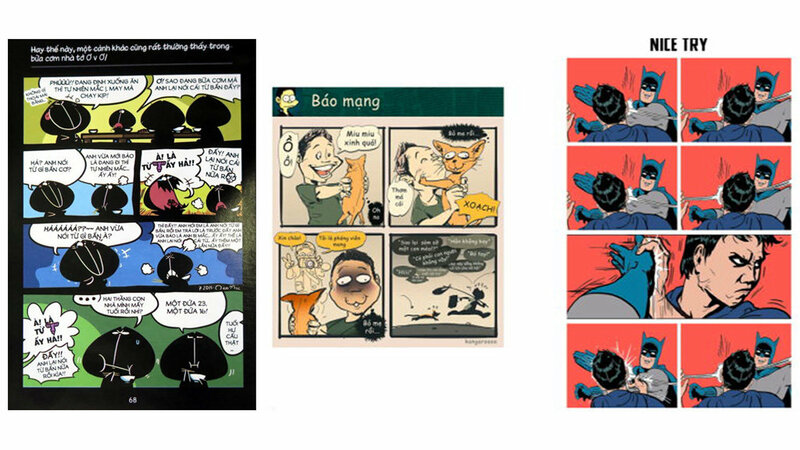 This up-and-coming generation of Vietnamese artists is taking to the Internet to seek out their readership, utilizing social media platforms as a medium for their work and funding comic projects through Vietnamese crowd-funding sites such as Comicola. This reemergence of the industry’s popularity has brought light to censorship hurdles faced by some of the genre’s top artists. Details such as a little girl grabbing her mother’s breast as a joke and an onomatopoeic sound of a sword’s slash were asked to be changed before the comic could be published, despite being labeled for readers from 16 years of age, Duong said. Still, Duong has been luckier than many of his Vietnamese colleagues whose work never even made it to the shelves, including artist Dao Quang Huy whose book was rejected by local publishers for ‘distorting fairy tales’. “Publishing censorship in Vietnam is a grey area that depends entirely on the sentiment of censors who lack specified criteria on which they can base their judgment,” Huy said in an interview with Tuoi Tre (Youth) newspaper. 'Long Than Tuong' comics by Vietnamese arttist Nguyen Khanh Duong. According to Duong Thanh Hoai, deputy director of Nha Nam book company, comic editors at publishing houses in Vietnam are held back by a fear of ‘violating fine traditions and customs’, a vague term in Vietnamese publishing laws that has yet to be defined by the country’s lawmakers. Artist Khanh Duong suggests that the country’s publishing watchdog and publishers establish a comic rating system to address this problem. “Comics are different from fairy tales in the sense that they must incorporate humor, coherence, diversity, and unpredictability in order to keep readers attached,” 26-year-old reader Thanh Tung weighed in with his opinion on the obsolete view that comics are only for children. Meanwhile, foreign-imported comics are allowed much more breathing room in their content, as they are labeled according to their level of violence and suitability for certain age groups instead of going through content censorship, deputy director of Tre (Youth) Publishing House Nguyen Thanh Nam told Tuoi Tre. “If Vietnamese artists are freed from limits on their creativeness and explorations, they will soon be on par with regional artists,” comic enthusiast Thu Do said. Vietnamese authorities are not so eager to board the train of change, however, as head of the country’s Bureau for Publication, Printing and Distribution Chu Van Hoa said it would take careful research, evaluation, and scientific conferences in order to establish a formal age rating system for comics in Vietnam. 'Mat Ngot Chet Meo' comics by Vietnamese artist Dang Ngoc Minh Trang.